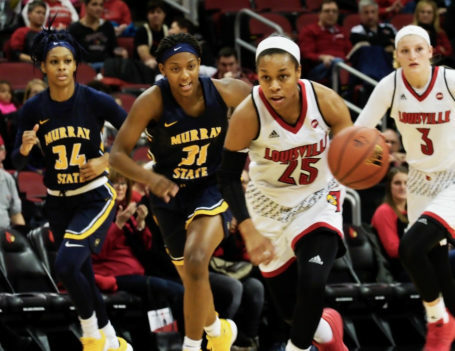 Asia Durr leads this Louisville fast break but spent most of her time watching the reserves while racking up an all-time program record of 115 points against Murray State (Cindy Rice Shelton photo). A record that will stand for a while. 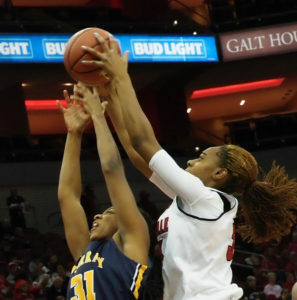 Bionca Dunham goes high over Murray State’s Brianna Crane for one her 16 rebounds (Cindy Rice Shelton photo). Things are going right for the University of Louisville women’s basketball team when the reserves outscore the starters. The bench putting up 76 points to only 39 for the starting unit. 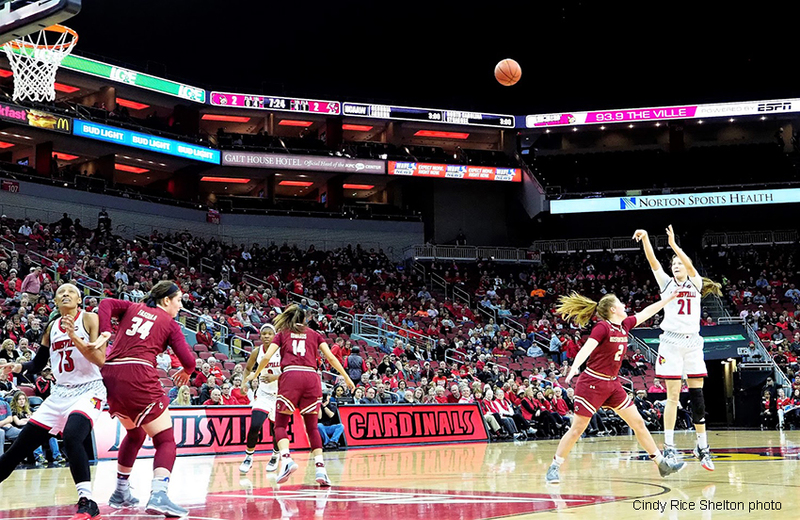 The end result was a 115-51 win over Murray State on Friday, a new record for the program before a crowd of 6,881 at the KFC Yum! Center, improving the Cardinals’ record to 5-0. Some different names among the point leaders, including Kylee Shook with 21 points, Sydney Zambrotta with 16, and Dana Evans with 14. But the dominating force was still another reserve, Bionca Dunham, turning in her first double-double with 19 points and 16 rebounds. ”Four of our five in double figures come off the bench, and that’s important because we have to have that depth and balance,” said Coach Jeff Walz. 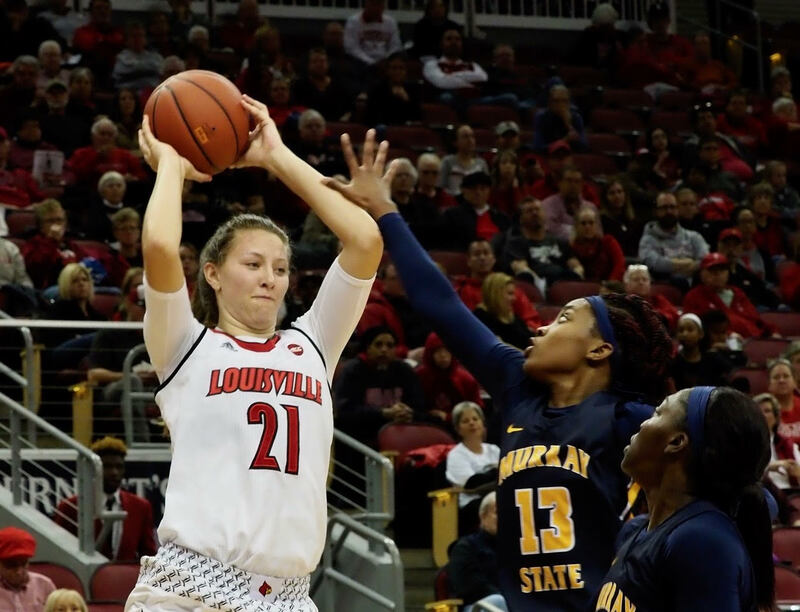 Sam Fuehring, the only starter in double figures, scored the first four points to give a UofL a lead it would never relinquish. She would wind up with 12 points. Myisha Hines-Allen and Jazmine Jones had 8 points, Asia Durr had 7, and Arica Carter had 4. The bench making it look easy. Kylee Shook breaking loose for a personal high of 21 points to lead all scorers (Cindy Rice Shelton photo). Apparently when Jeff Walz sends a message to a University of Louisville player, he wants to make sure the individual has time to consider the desired result. Just ask Kylee Shook who was benched quickly in the second half against Virginia Tech on Thursday. Kylee Shook attacks the basket for two of her game-leading 14 points (Cindy Rice Shelton photo). So surprised when she had a wide open path to the basket, Kylee did an awkward ball fake, was called for traveling, and summoned to the bench. Done for the night, having to think about it the rest of the night and over the next three days. Imagine her relief, then, when Walz tapped Shook as the starting forward the following Sunday. The coach appealing to her competitive edge, hoping she would react in a positive way, needing her to be a leader. 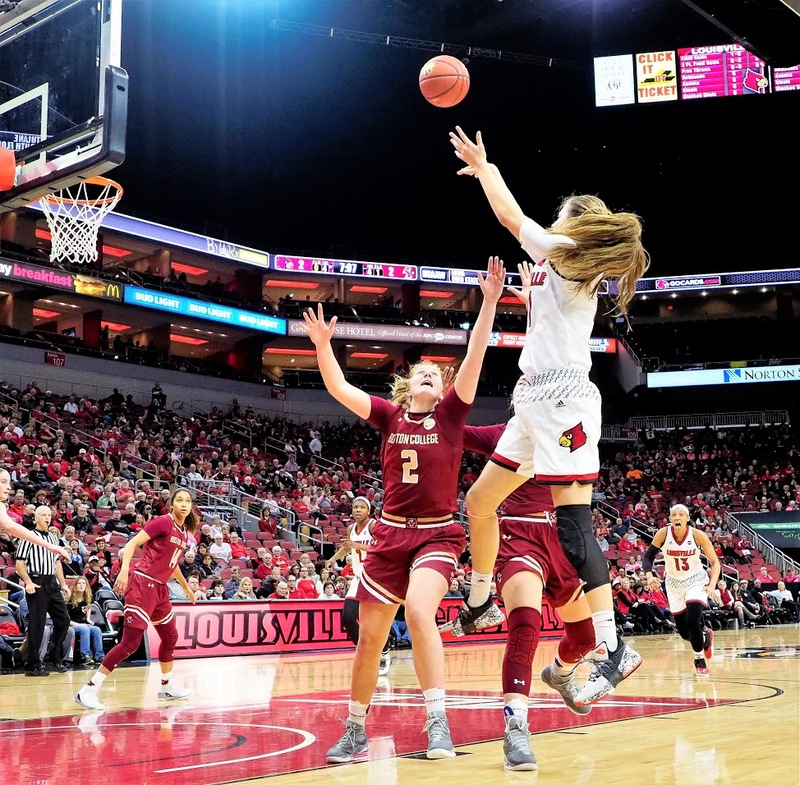 Shook would do just that, the young 6-foot-4 freshman responding with one of the best games in her career in a 68-43 win over Boston College before 9,306 fans at the KFC Yum! Center. 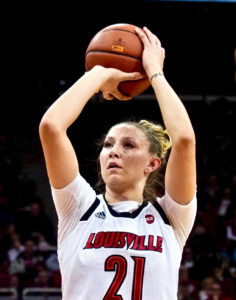 She would make six of 10 field goal attempts, including two of three 3-point shots, to lead all scorers with 14 points while pulling down five rebounds. No mishaps in this one, either, Shook with zero turnovers in 20 minutes of playing time. 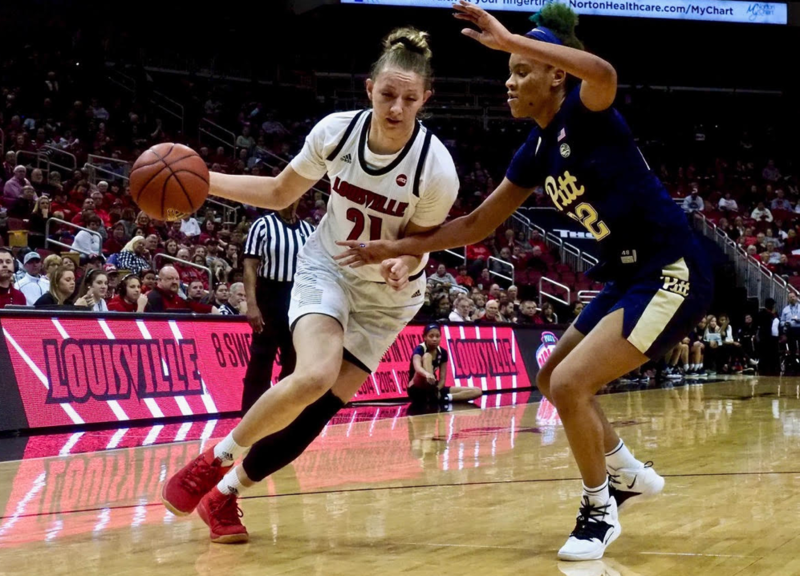 Before one gets carried away, however, it should be noted that Shook may have gotten the starting opportunity because Asia Durr, UofL’s leading scorer, was the one on the bench in this game. Also of note, Mariya Moore did not return for the second half after making three turnovers and missing all six of her field goal attempts in the first 20 minutes. More messaging? Or was it because she wasn’t needed? Myisha Hines-Allen, who had 10 points and 13 rebounds, saw only eight minutes in the second half. Regardless, they will have all week to think about it, UofL not playing until next Sunday when North Carolina arrives for a Noon tipoff. A long week ahead, plenty of time to let any object lessons sink in.